Sure enough though, the world provided the opportunity. 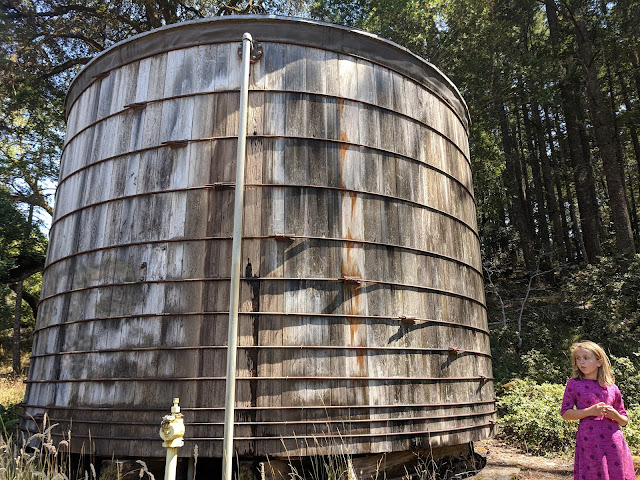 A few weeks ago, on a camping trip, the gang reinforced their knowledge about water pressure when we stumbled upon an old water tank in a forest across the bay from San Francisco. The gang wandered over to check out the wooden tank. It was built of vertical planks held together with steel cables. My partner took the time to point out to the kids that their were more cables binding the bottom of the tank than the top. She reminded them what they’d learned about water pressure—that water stacked up on top of water built more and more pressure. She pointed out how it took more cables to keep the tank from bursting at the bottom than it did at the top Voila, scientific reinforcement in the real world! The kids didn’t have to do homework, or memorization, we all just had to enjoy ourselves. The real world provided reinforcement at no extra charge, because, that’s what the real world is happy to do for all of us.